July is the calm before the storm in the winemaker’s calendar so Libby and I took our two-week summer holidays. And yes, you guessed it, we went to visit some wine regions, however we compromised with some lovely hotels with spa and swimming pools along the way to ensure it wasn’t a pure wine holiday! This is not just a blog, but a little insight into a fascinating journey which may help you discover, as I have, a truly beautiful, gastronomic, off-the-beaten-track wine route. Hopefully others will use the addresses I have put together to enjoy the local traditions and hospitality we experienced. After France, our second most-favourite country is Spain: such a diverse, energetic, happy and although-laidback, extremely dynamic country. We decided to start our travels in the North East Basque region. This area is rich in history, food and wine and of late, the superb town of Saint Sebastien has kept stopping us from going any further! This year, we drove purposely straight past it (trying not to think of the glorious tapas bars) and onto the vibrant city of Bilbao, capital of the province of Biscay, just three hours from Bordeaux. Bilbao may not be the most picturesque place in the world but it is an absolute must. 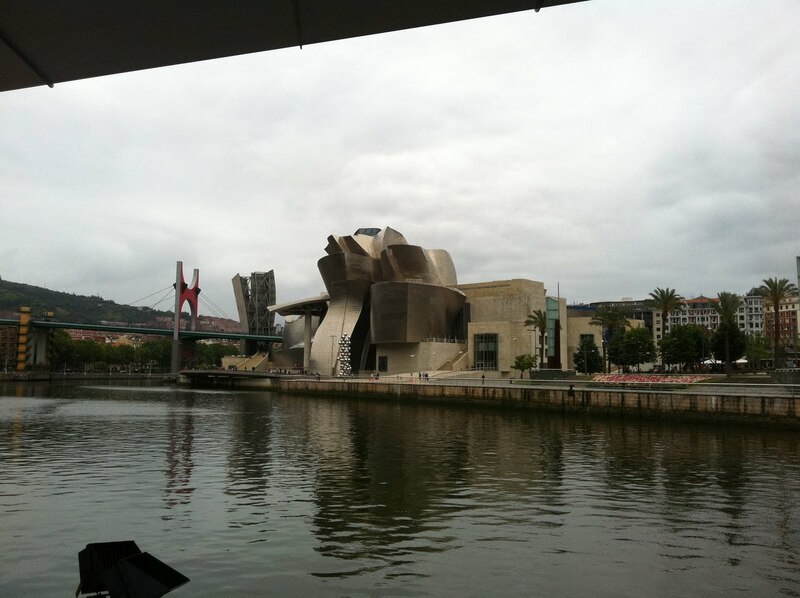 Nestled in the green lushes of the Txakoli wine region, it’s home to the world-famous Guggenheim Museum. 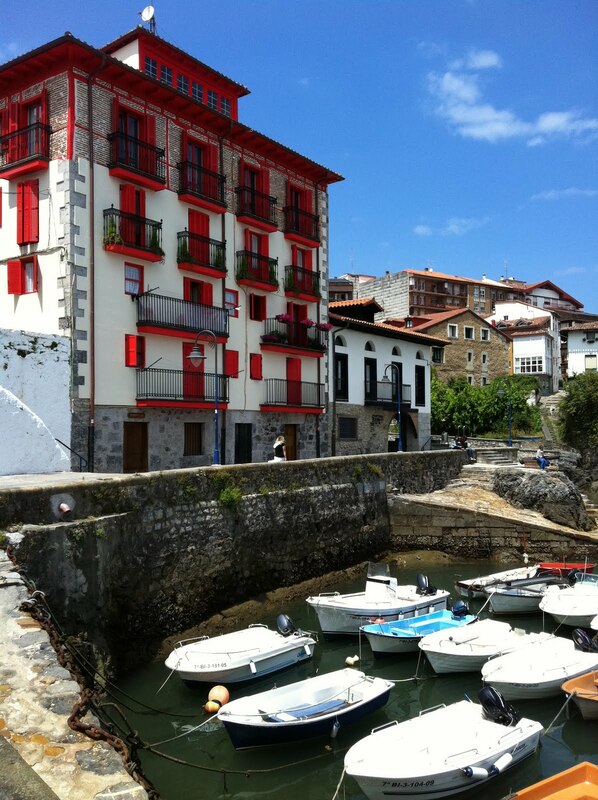 The town is almost like it was once perched up high on the hills before falling into a trough like a box of jumbled up Lego, eventually coming to rest around the estuary of Bilbao on the Iberian Peninsula. On the surrounding hills the dry petillant white wines are made from the Hondarribi beltza and Hondarriba zuri grapes. There is a lot of rain here and no surprise the area is known as ‘green Spain’. We found our hotel easily, the modern but well-priced Barceló Hotel on the top of the city. The hotel is in a very good location, with easy parking close to the town centre. The only problem is there are a few steps down to hub of the city; however a late night seven-euro taxi ride back up the hill with bellies full of tapas is a reassuring option! The walk down to town is very pleasant, with houses supported by little bars rising up from the cobbled staircase. After ten minutes or so you are embraced by a warren of streets and hidden plazas full of life and tapas bars! 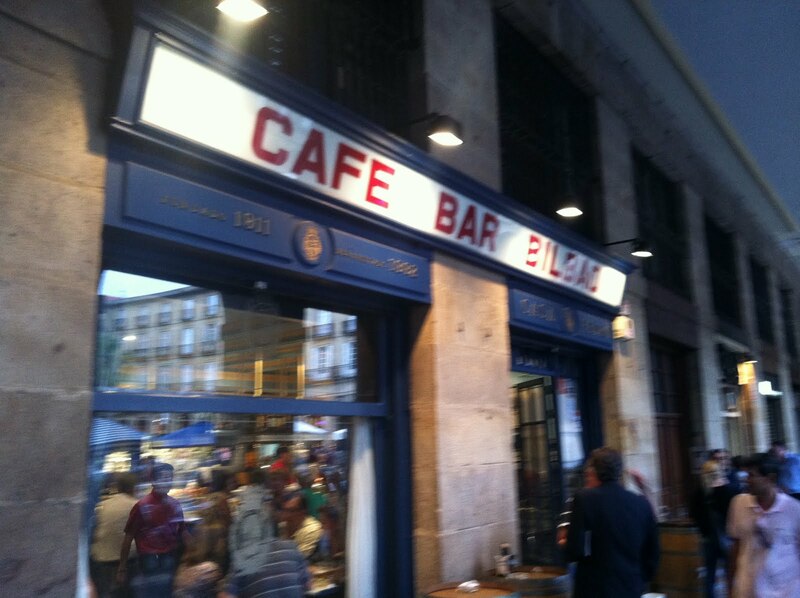 On recommendation from our Basque and Chai Au Quai vintage flying winemaker friend Maitena, we headed straight to the source: the Plaza de Nueva and the ever busy Café Bilbao. 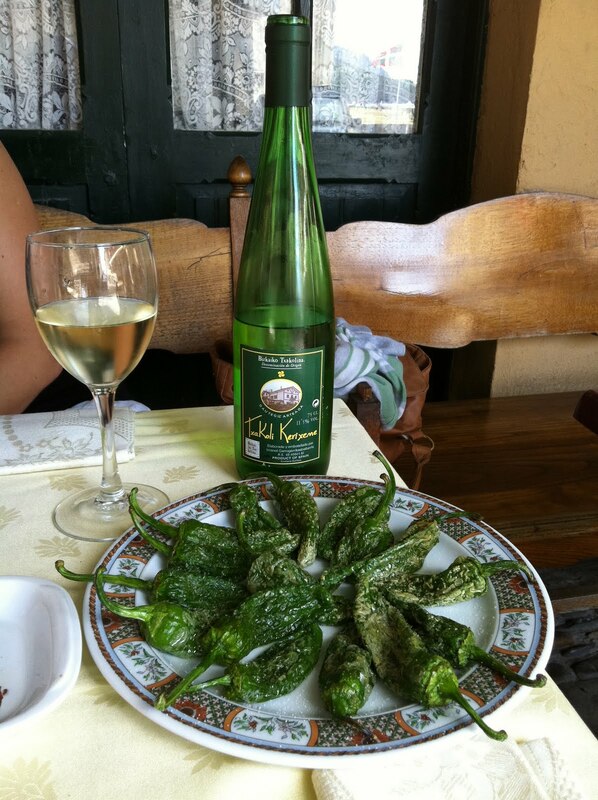 Here we dined on the best fresh ham and salt cod croquettes and other delicacies from the tapas selection, washed down with superb zesty dry white Txokoli. Later on the central square was alive and buzzing with fire wielding acrobats until well past midnight. The next day we were up in good time for a day at the Guggenheim museum (design by US architect who sketched the design on the back of napkin in a local café and also is responsible for the incredible Rioja bodega Marquis de Riscal). Back down the steps and after walking for 20 minutes along the estuary, the titanium-clad mad building suddenly appeared, shining in the sunshine and reflecting off the water. 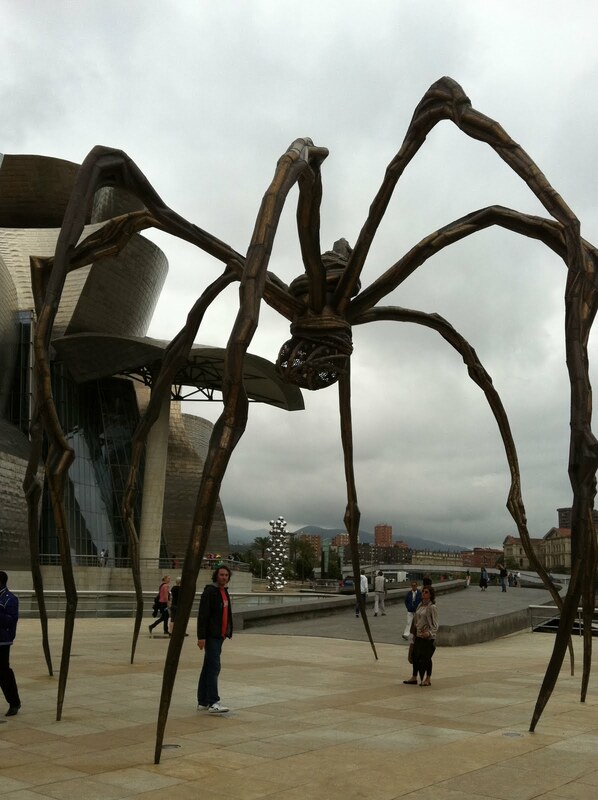 Crazy sculptures of Dali-like spiders, smooth Charlie and the Chocolate factory-type foot bridges and 30ft huge cats made of flowers decorate the outside of the museum. Please allow the whole day for the visit and a reasonable 12-euro entry fee and decent bar and food inside caters perfectly for tired legs. Not actually a huge fan of modern art but after all, it’s Libby’s holiday too! I actually found the exhibits diverse, interesting, interactive and incredibly exciting. Six hours passed very quickly indeed! That evening we wandered back to the Plaza to another recommendation: the Victor Montes restaurant where we ordered Piri Piri Salt Cod and white asparagus. It also has the most extensive list of old Spanish wines from the owner’s personal cellar … and the prices are irresistible! We had a 1994 Ribera del Duero red from Pesquera for 20 euros! 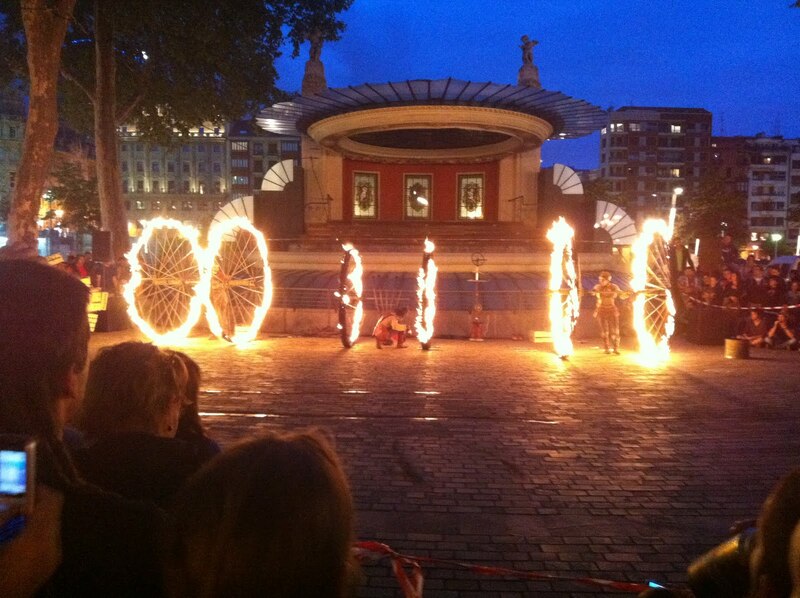 The town centre was buzzing well into the night with lots of amazing fire acts in the main Plaza! 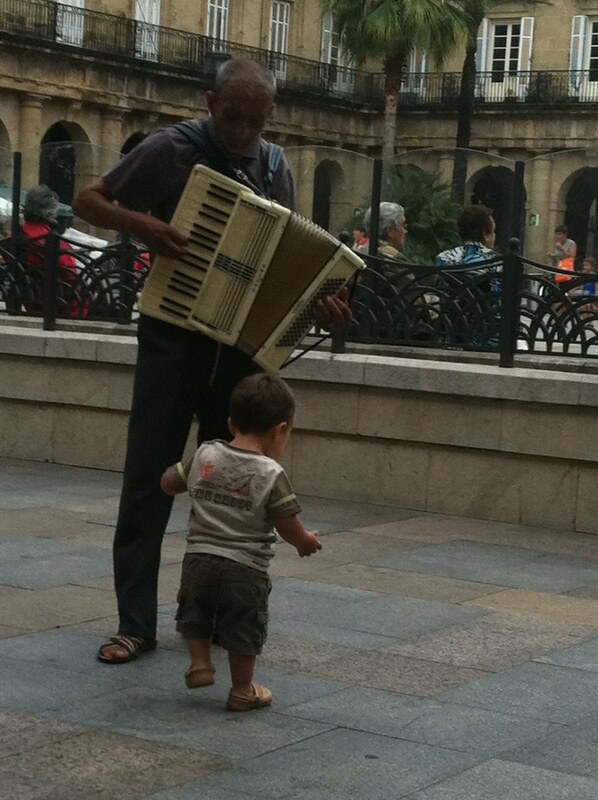 A couple more nights in Bilbao would have been perfect but the mission was to keep going to discover more! 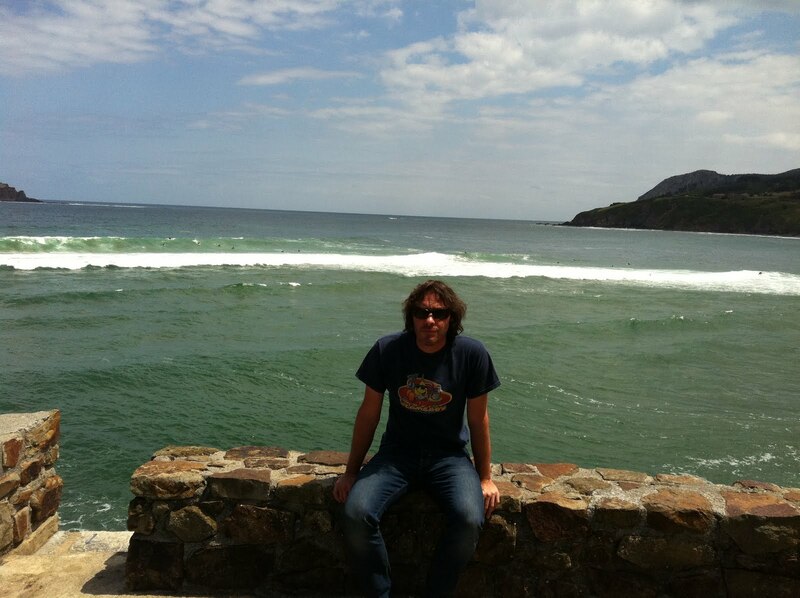 Mundaka is world-famous on the surfing scene for the longest left hand breaking wave in Europe. This powerful wave is due to a consistent sand bar that jacks up the Atlantic swell and mixes with the currents of the Guernika river mouth to form exotic Hawaiian like hollow tube waves up to 14ft! However, it is an extremely calm and laid-back place, apart from when it stages the World Surfing Championships in the month of October. 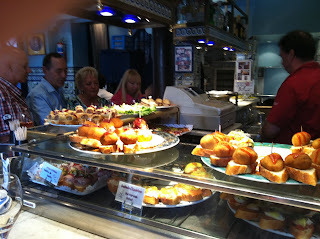 We ate some of the best seafood here; the highlight being at the easy-to-find La Fonda restaurant. 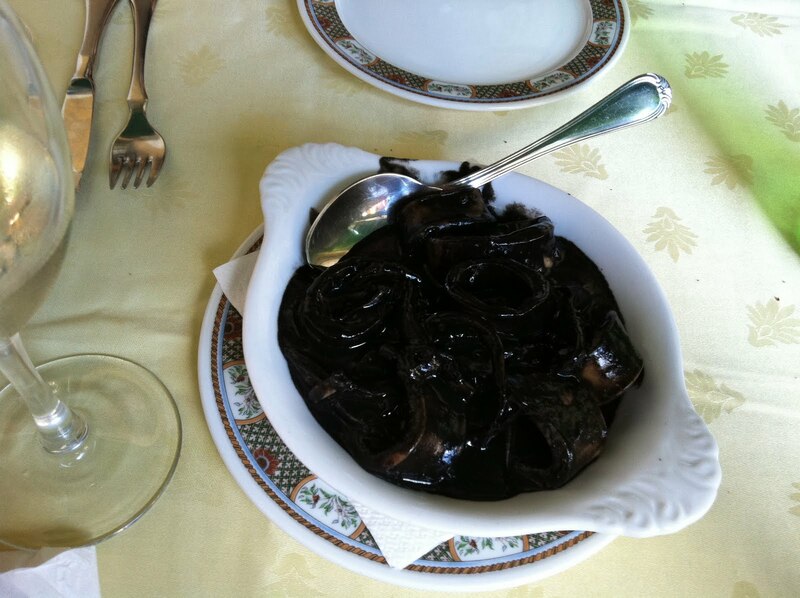 Their speciality is locally caught squid cooked in it own black ink (around 20euros for two people) accompanied simply with small grilled green peppers (pimento verde) and of course, cold Txakoli. Reluctantly escaping another paradise yet again (where we could have easily stayed for a week) we headed directly two hours south to Peñafiel, in the heart of the Ribera Del Duero wine region. Watch this space for part two!